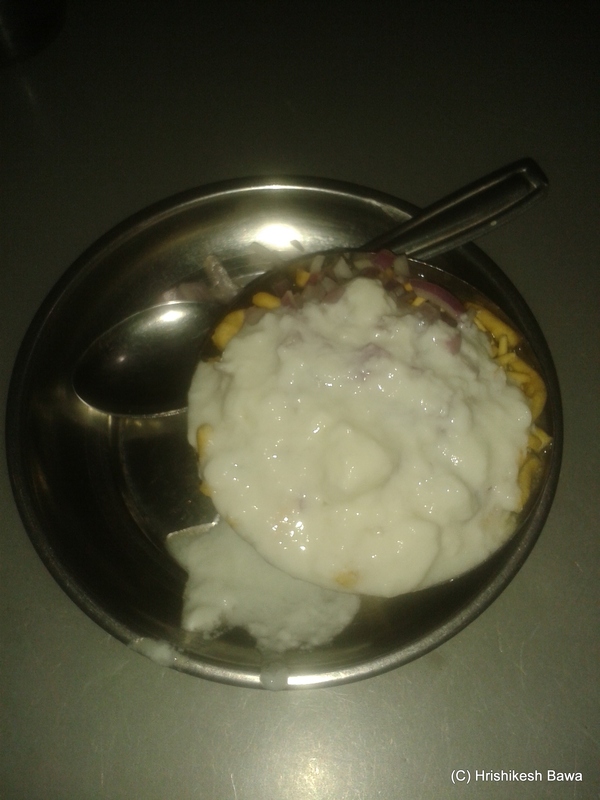 Sev Usal is a spicy Maharashtrian dish. Sev is actually fried noodle like strands made of chickpea flour and fried, while Usal is a gravy made with white peas and chutneys along with spices and condiments like ginger, garlic, tamarind and so on. The dish is an incorporation of the two elements. While it can be had by itself, it is more enjoyable to be had with a bread bun locally called as Paav in India. While Sev Usal is not a dish that is native to Baroda, people of this city have brought it as close to perfection as possible. In turn, the residents of Baroda have showered love by making it a staple part of their diet. A Sev Usal stall is common sight. 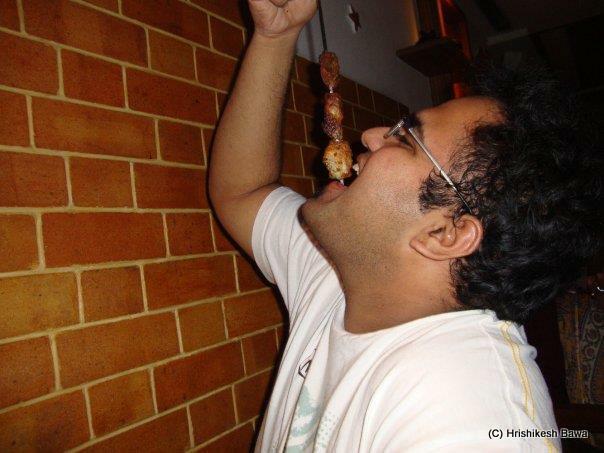 In fact, in terms of food dishes it is considered by many to be the pride of Baroda. Locally, Mahakali (named after the Hindu Goddess) is one of the most popular places to have this at. Such is the popularity that many more small time stalls bearing the same name or a variation of it have come up. 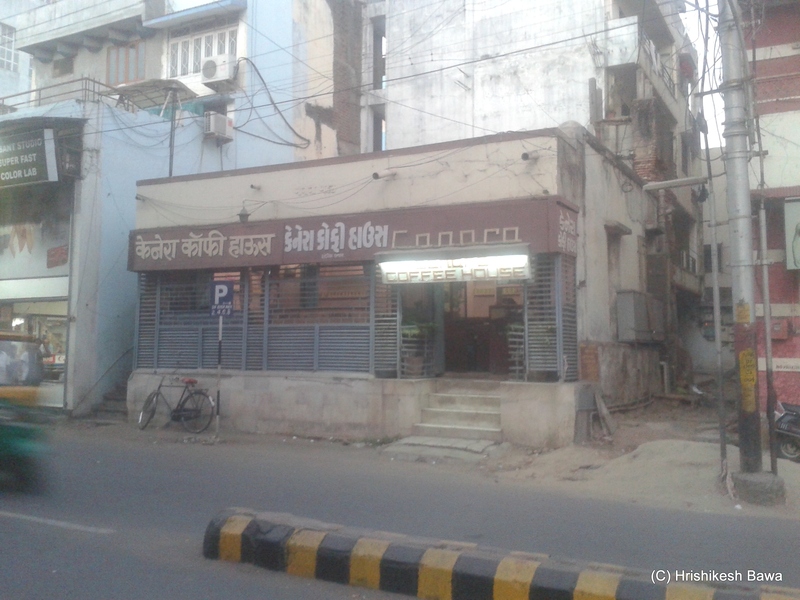 However, my personal favourite place to have it is the Jalaram Nasta house which is also called Lalabhai’s Sev Usal centre. Located inside a lane that opens to a road, it is not very easy to locate unless you’re specifically looking for it. I remember getting lost, the first time I went there alone without my friends who would normally take me there. It is marked by a banner in red with the name written in white in Gujurati. You will first be given a premixed dish to get you started with. If you ask for extra (and I always do), you’re first served the sev and onions, while the gravy comes few moments later. You can mix and match the sev with the Usal to get the combination you feel right. This is how I start. An important aspect over here is what is locally called the ‘Tari’. It is basically a chilly preparation made from oil, green and red chillies. 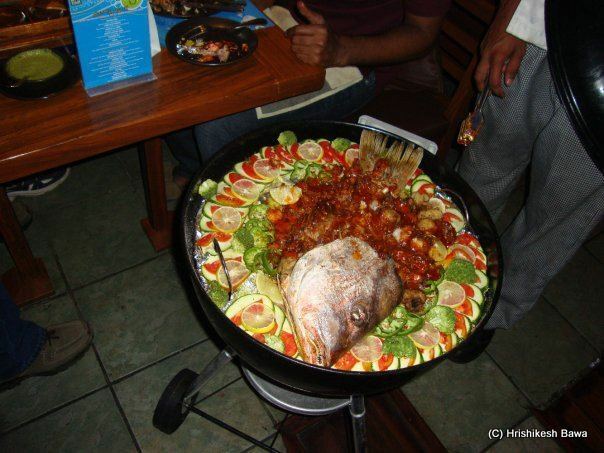 It is very spicy, and is added on top at the last before mixing the whole thing. To be honest, this is one of the reasons that gives Sev Usal its signature feel and adds an extra dose of yum. And there, you finally have your Sev Usal ready..
Feel free to dig in.. Part of their team was happy to be part of a picture that I took before leaving. I am attaching its location on Google Maps for you to locate it. Written for day 10 of the A to Z challenge. This is another place that I stumbled upon by accident. I was looking for a place that accepted online orders and payment for home delivery orders, when I came across HOLA Mexicana. I enjoyed their food so much, that I ended up ordering at least once every week for some time. Soon it dawned upon me that while I have had their yummy food many times, I haven’t actually been there even once. I made up my mind to go there over the weekend. 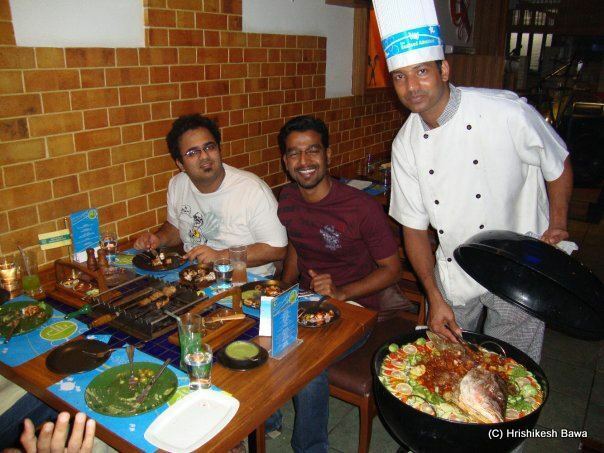 HOLA Mexicana is quaint little place nestled in a building complex Fatehganj, Baroda. Their banner is well lit, so that you don’t miss it. The only catch is that you can easily park a two wheeler, but a car will need some efforts. 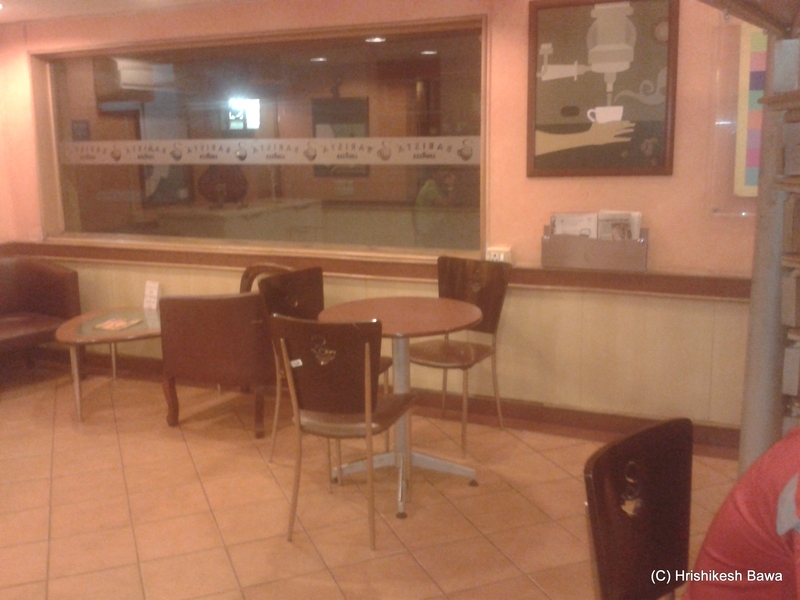 They have a warm looking interior, which can easily manage 20 or so patrons. 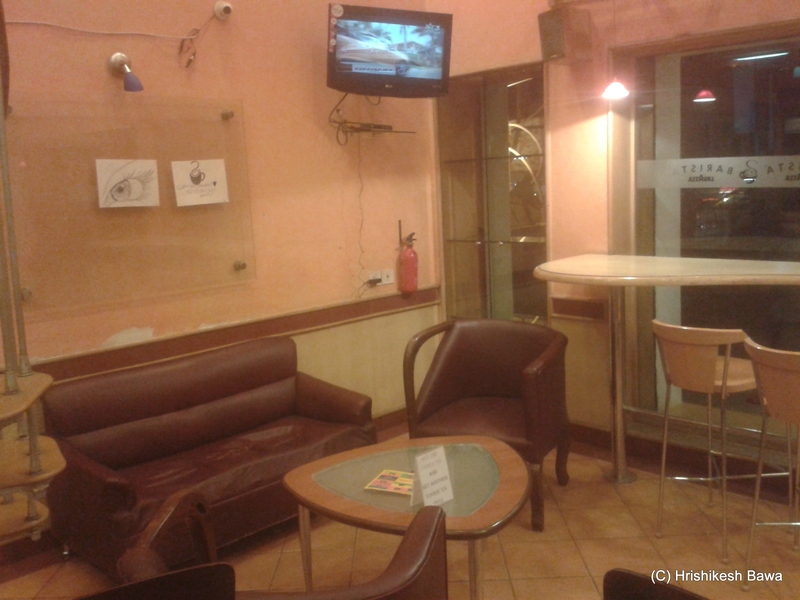 One of the plus points is that they have A/C and wifi, so it makes spending the hot noons or evenings easy. One of my regular orders over here is their mexican rice. While they offer both veg and non veg options, I like to go with the chicken version. It is a fabulous combination of rice, sauces, spices, tanginess, vegetables, beans, shredded chicken (since I go for the non veg version) and cheese. I have had it almost everytime I have ordered from them, and I still enjoy it each and every time. This is what the bowl of mexican rice looks like when you receive it. I like to give it a nice mix, before diving in. Not one to get satisfied with just one bowl of rice, I order something else to go with it. This time I ended up with one of their omelettes. They make a nice fluffy omelette that has stuffing inside the fold. Mine had chicken, vegges, spices and cheese. Needless to say it was absolutely delicious. This is hands down, one of my favorite places in Baroda to have mexican food. I will leave you with a picture of the HOLA Mexicana team who were happy to pose for a pic for me. I love those happy accidents when I find a place I have never been to before, and end up having brilliant food at it. One night, my old room mate and a friend came over and asked me to join them for a drive. Since none of us had dinner, the idea was to have something on the way. We had taken the old NH8 highway out of Baroda towards Ahmedabad. Around 9 kilometers on the highway, we stopped outside this place which we hadn’t seen before. Since the place had opened only two months ago, few people knew of it then. I absolutely loved this idea of having small tents over each table. This way you can enjoy the cool breeze that is blowing, and yet maintain your small personal space. There are lights and pedestal fans inside the tent, for when the wind is not enough. These are how the tents looks up close. There is enough space inside for a group of 6 to sit and eat comfortably. And this is how my plate looked when we were eating. So, if you ever end up with a craving for Kathiawadi food, with some lovely ambience, I will accompany you here. 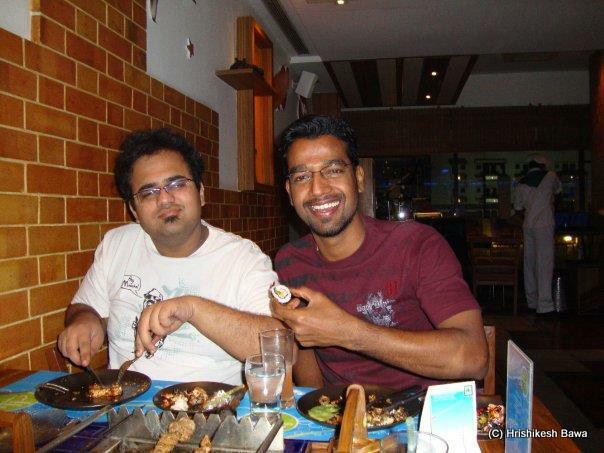 One of the first things that I wanted to know of, once I had taken up a job in Baroda was where all the good food is available. I have friends from college who call Baroda home, and they were more than happy to take me to the right places. 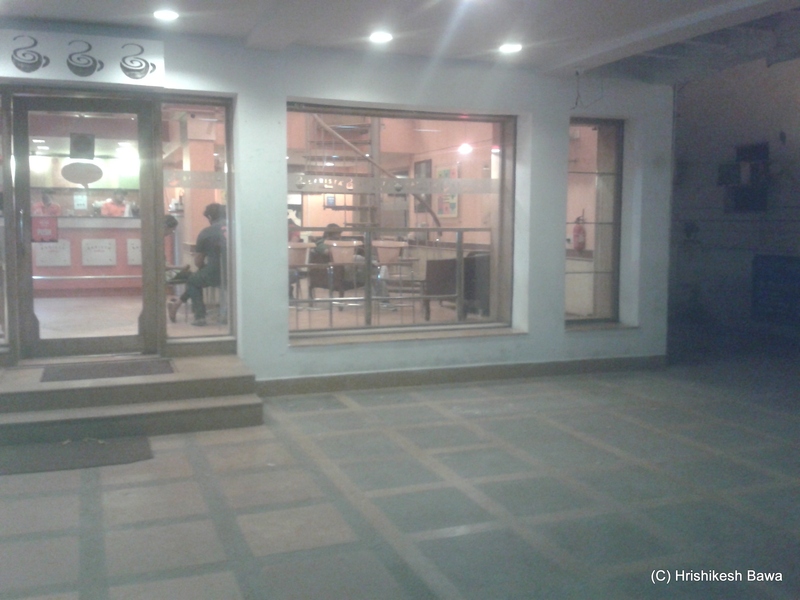 One such place is Canara Coffee house. 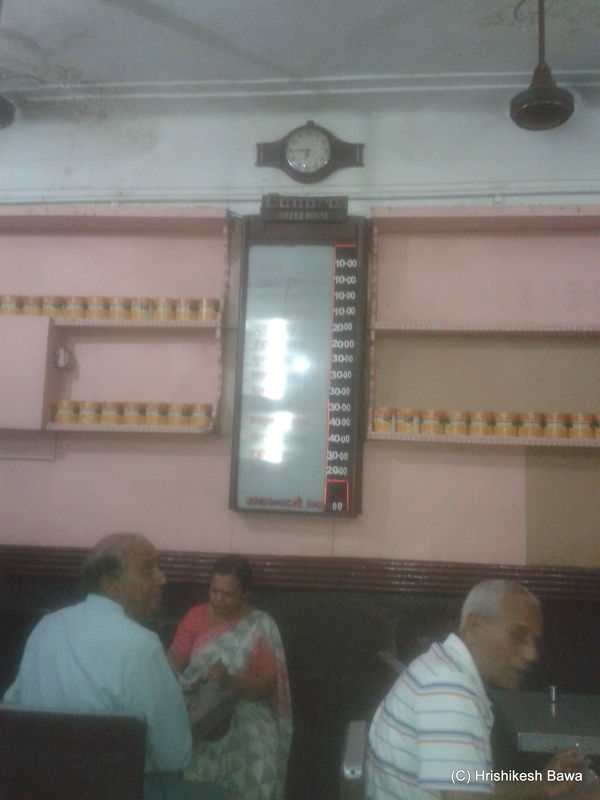 Canara Coffee house is a place where people have been going to with their family for years now. The place is popular strictly on account of word of mouth at how good their food, or because someone from the family has been going there for at least a generation now. 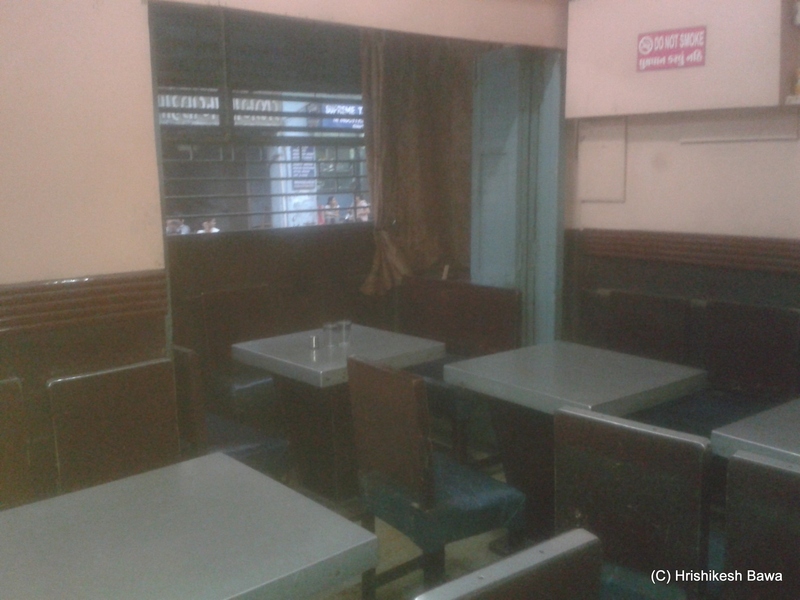 The thing that Canara Coffee house is most famous for is Poona Misal. Misal is a Marathi word and means mixture. Typically sprouted moong (green gram) is mixed well with spices and pastes, and topped with chopped onions and tomatoes along with some namkeen chewda. 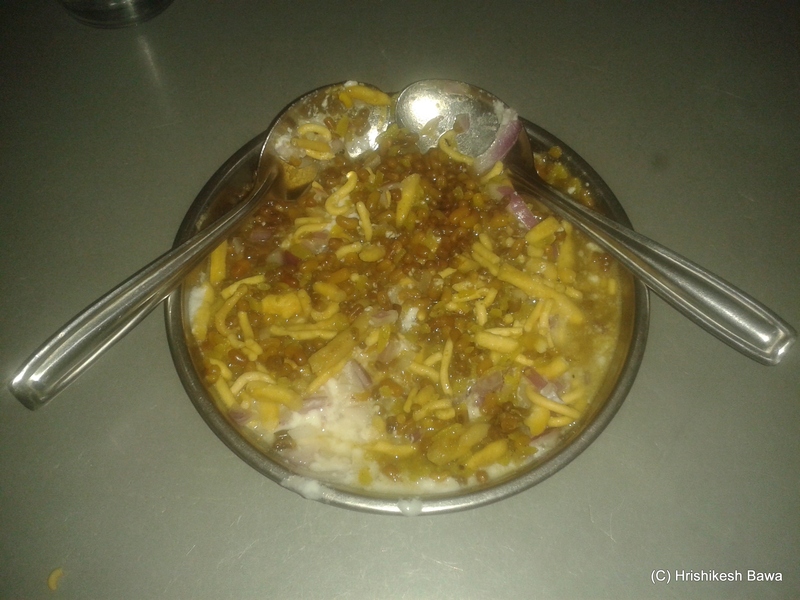 Namkeen Chewda is in itself a spicy mixture of dried and fried lentils, chickpea noodles (called sev), peanuts (called sing), roasted rice puffs (called mamre), and more. A generous helping of curd is given along or dabbed on top so that it serves to cool this hot and spicy mixture. You can choose to have it as it is, but that is not fun. You can take a spoon, and mix it all up. This gives you a lovely mixture of things hot and cold, sweet and spicy, crunchy and wet. 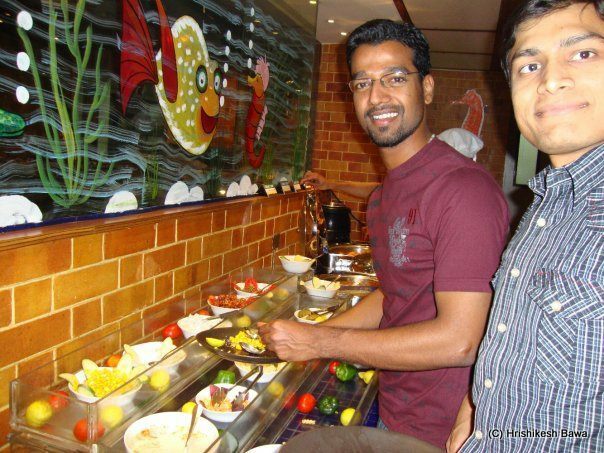 Another thing that this place is famous for is their South Indian food. 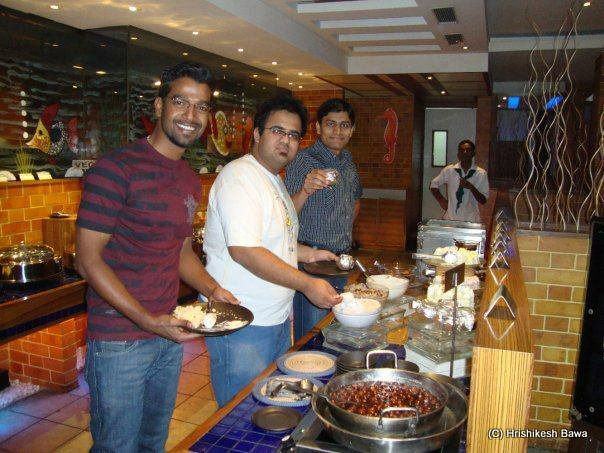 You will find the standard fare of Dosa, Idli, and Uttapam here. 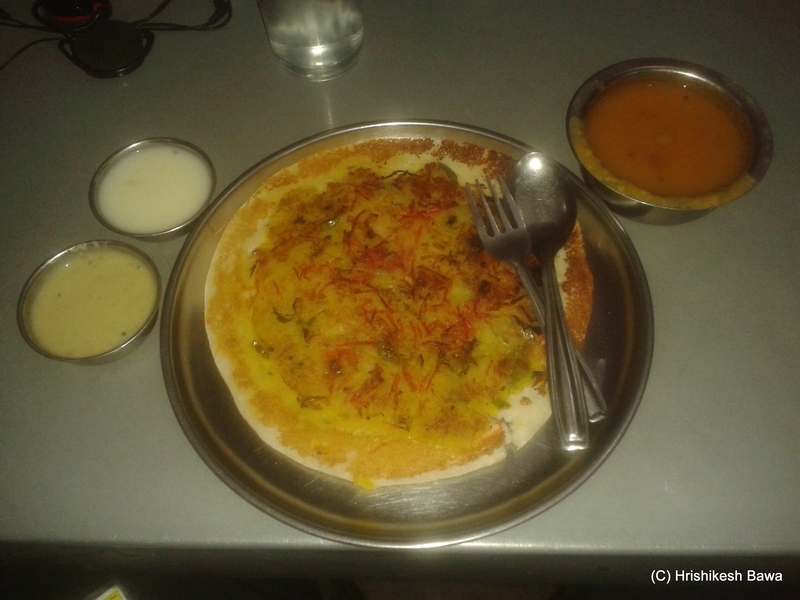 MY personal favorite happens to be the Masala Uttapam which is pan cake made from a batter made mainly from rice and dal. Then a generous layer of spiced, mashed, boiled potatoes along with onions is applied. When you have it with their Sāmbhar and chutney, it is absolutely yum. Look at these pictures which show how the place still retains its old charm. The thing with the lights is their menu. They have a wonderful concept for the menu here. 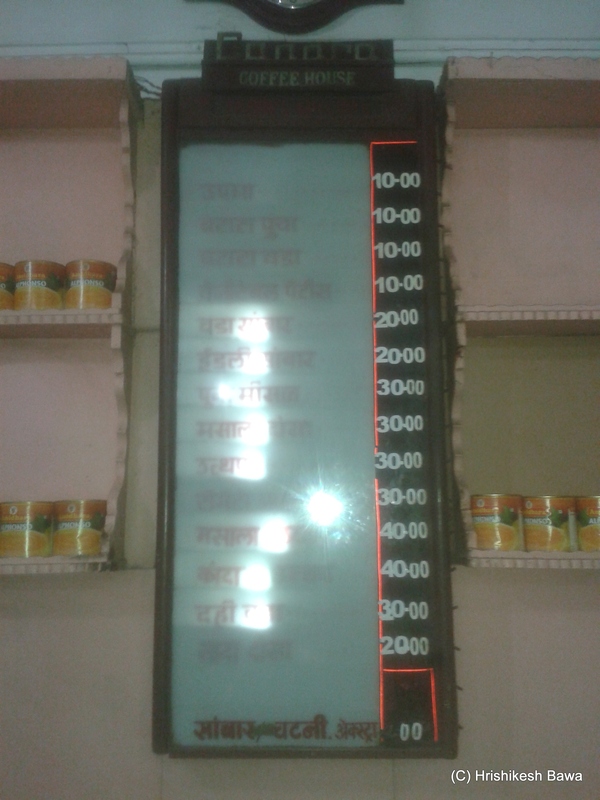 The menu has a listing of all the dishes they serve along with its price. Since the things that are served change for breakfast and evening meals, each item has a light turned on to show if it is available for serving at your time of order. I absolutely love it. If you ever want to visit this place, I am attaching its location on Google Maps. Let me know when you’re coming, and we’ll enjoy a meal together. Everyone has a place that is special for them. A place which they are not just fond of, but a place that makes them feel comfortable, a place where they get a feeling of belonging. 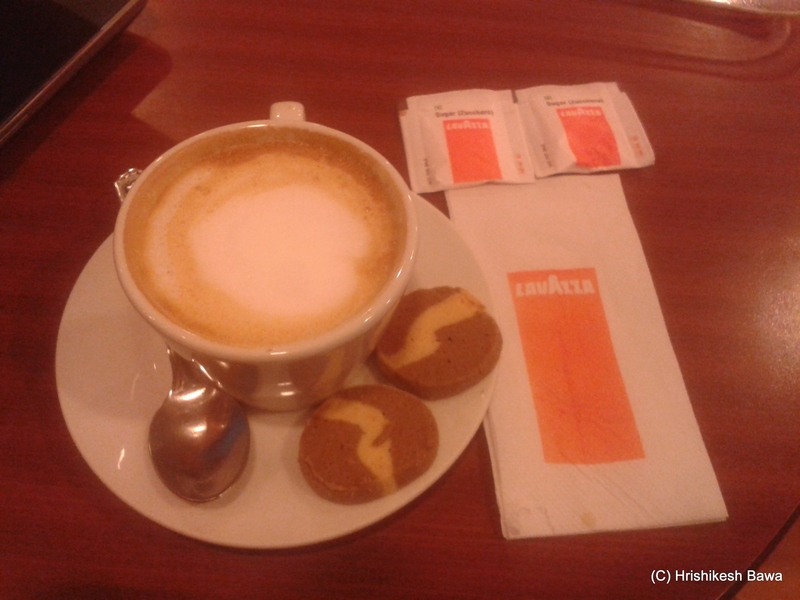 The Barista Lavazza café in Baroda happens to be mine. 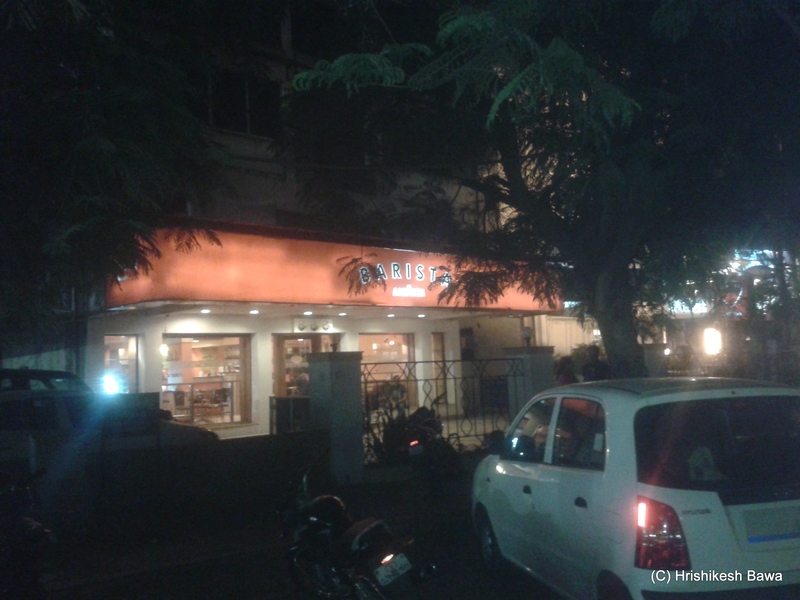 Baroda is not where I came to know of Barista, our connection is much older than that. More than 10 years ago when I used to haunt the Crosswords book store at Mithakali in Ahmedabad, I would spend time in the adjoining café with the book I would have had bought. 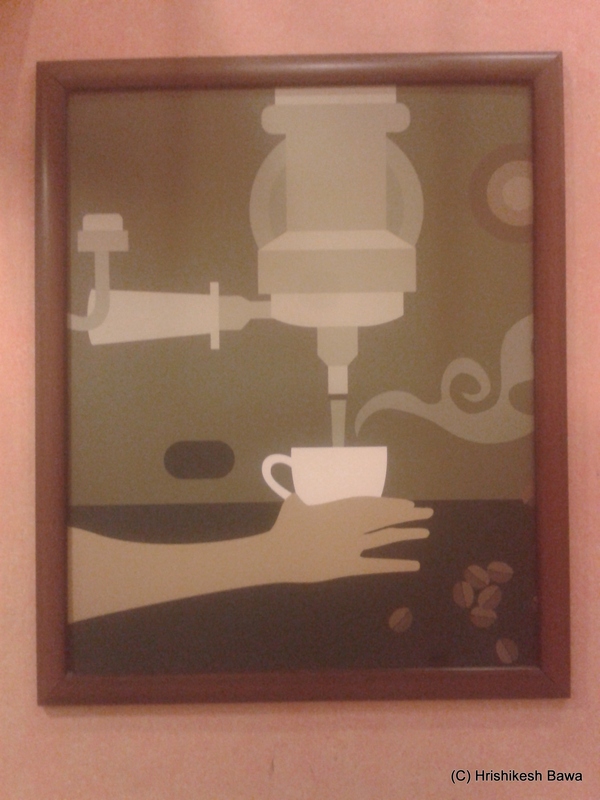 That café happened to be Barista. It was a ritual for me to read my pre-ordered Harry Potter on the day of release in Barista. When having bought anything other than Harry Potter, I would spend less time in there, but a visit was always on the cards. Then something horrible happened. Barista shut down, and was replaced by some other chain of coffee shops. It was decent, but didn’t have the same feeling as Barista. 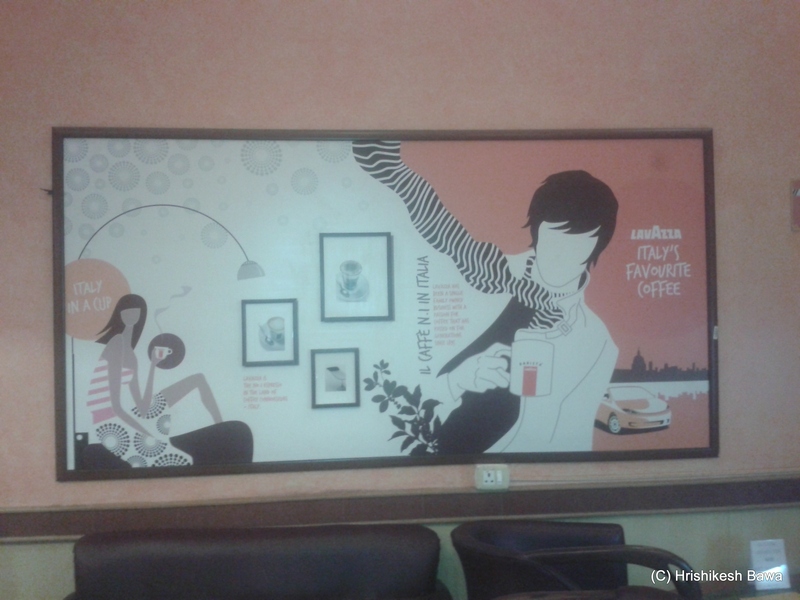 Years later, when I had to meet a friend in Baroda, she asked me to come to Barista. I was overjoyed to learn that Barista had opened sop again. Lavazza had taken over, and opened up at new places. They were smart in the fact that they didn’t change what was already bringing back the old loyal customers, and yet had something for new lovers. My love was back. After renting out a different place with new roommates in the same area, I could easily spend more time at Barista. It was natural for one of us to be tired from work, and ask the other to join him for coffee at Barista. Barista still serves some of the best coffee that I have had. Their hot chocolate is to die for. Let me walk you through the place with pictures. This is one of the few places that I know where people love sitting outside as much as they love the insides. There is no special sitting arrangement outside, just two ledges on either sides of the door where you have glass panes. There is enough space to sit on it. There have been many nights when roommate and I have spent sitting there just chatting away into the last hour of the night forgetting what happened at work, or sometimes just reading in silence. When we went in as a group, this was our spot. One could keep track of the score if there was a cricket match going on. We could all have our drinks and snacks placed in front us, on the centre table. 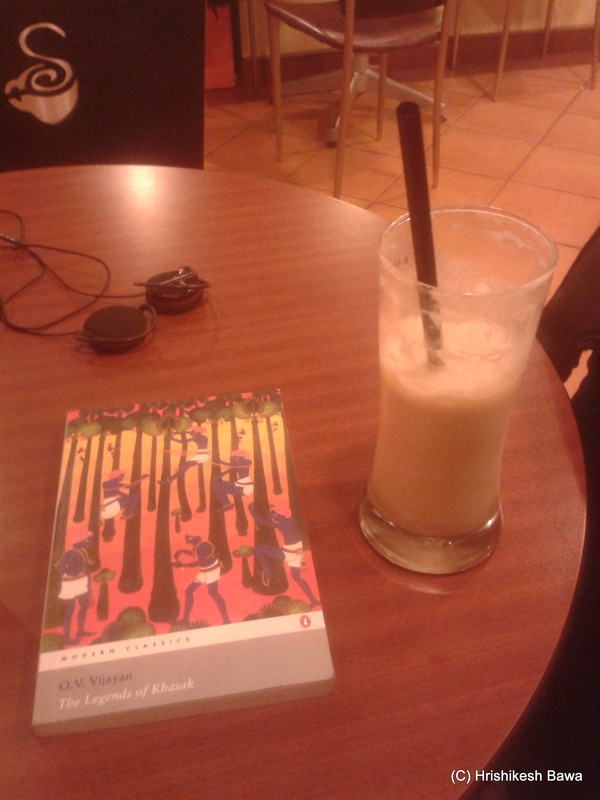 At times when I felt like reading alone, I would order a Brrista for myself. It is their version of a cold frappe which has icecream blended with coffee. The only sad thing about this is that I end up finishing it quickly in three sips, and am left wondering where it all went. They have such lovely wall art decor. 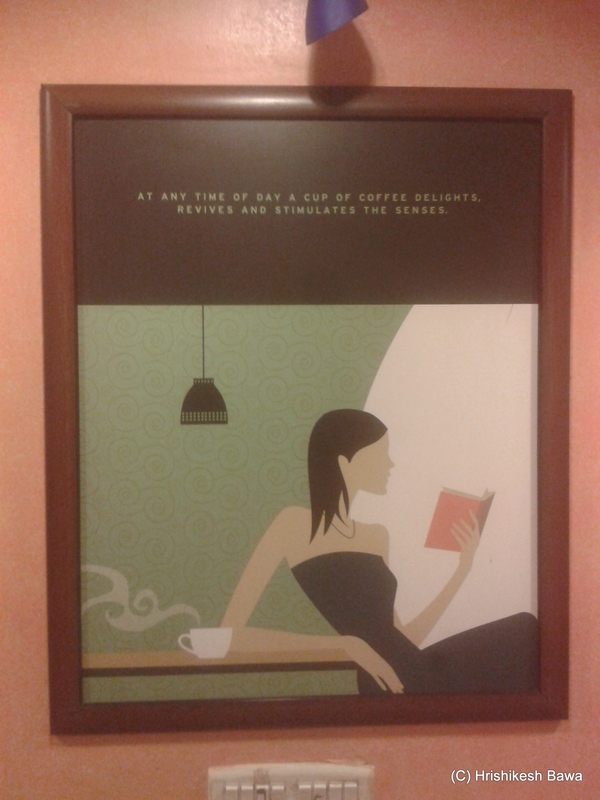 The first one has “AT ANY TIME OF DAY A CUP OF COFFEE DELIGHTS, REVIVES AND STIMULATES THE SENSES.” on it. This is another lovely piece they have, that takes up almost half of the wall. I love how they have not drawn the features and expressions of the people in it, and have left it to the viewer’s imagination. This is my spot when I go there by myself. If someone is already occupying it, you may find me sulking about it. The moment they leave, I get up and move to it before anyone else does. This a panaroma shot from the spot. I can cover the entire place from it, corner to corner. I can see the wash room and wait at my seat instead of having to wait at the door for the person to come out. The barista can signal for me when my order is done. I can look at the outsides through the door and glass panes, and keep an eye out for a friend who may have made plans with me. It also has a charging point right behind the chair, and I can keep my laptop plugged in. I remember sitting hours over there playing games on my laptop. One day I received a call from the Barista office regarding a feedback form I had filled up. 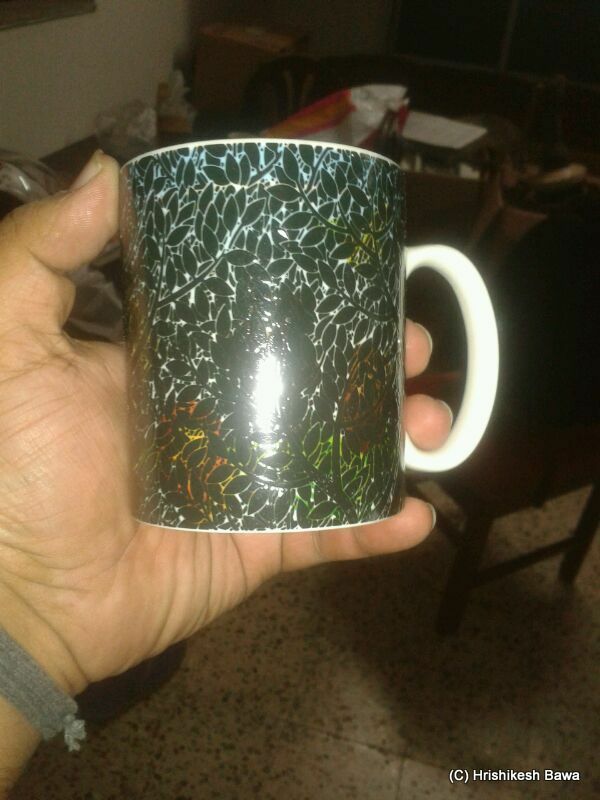 They had called to confirm my address, and they sent in this lovely mug as a gift along with a letter. 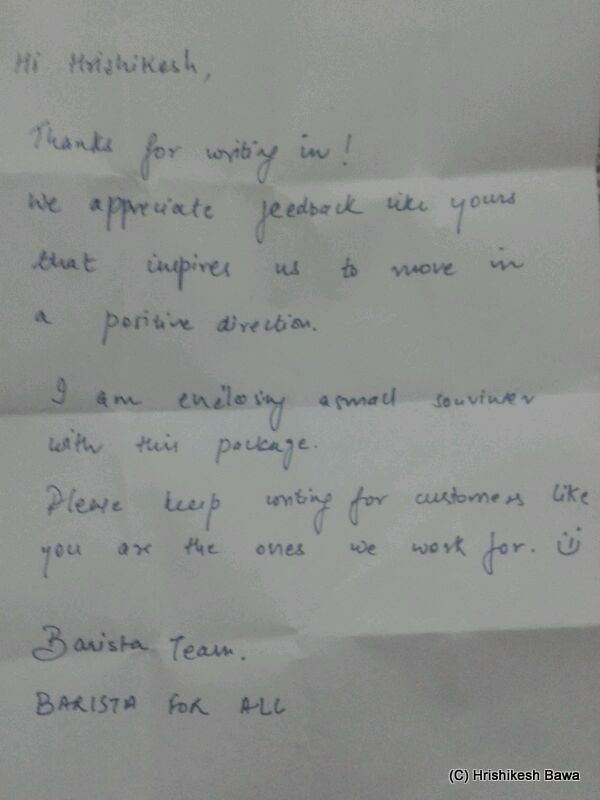 We appreciate feedback like yours that inspires us to move in a positive direction. I am enclosing a small souvenir with this package. Written for day 2 of the A-Z Blogging Challenge 2014. Food has always been something that makes me happy. Some of my favorite memories are associated with it. I think I have now come to a level where food is something beyond the daily nutrition a body needs. It is a spiritual experience. Food is something that can make you salivate as you look at it, a mere whiff of well-made food can give you goose bumps, while taking a long slow bite will have you close your eyes and just get lost and the juices flow down your throat. 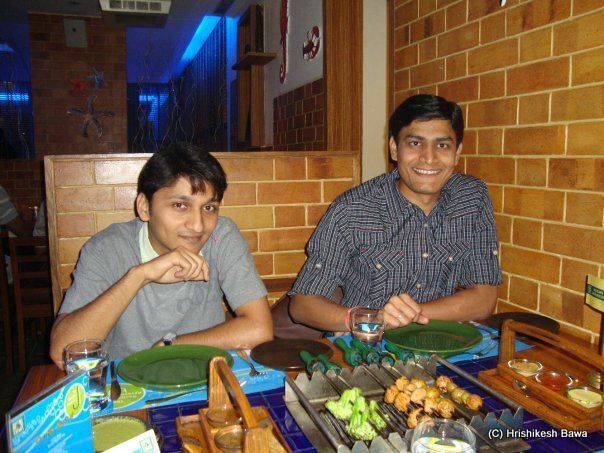 This post is about one of my favorite place to eat: Barbeque Nation (Vadodara). While I have been living in Baroda since 2009 started, and kept hearing rave reviews of the place I could only eat there a year after in 2010. It happened as a spontaneous decision, when I was discussing with a friend where we could get to eat some wonderful chicken. Twenty minutes later, we were giving out orders for juice at the place. Let me tell you how the place works. You select one complimentary drink from the menu (and can order more that will be charged extra), while they start serving you starters on your table. 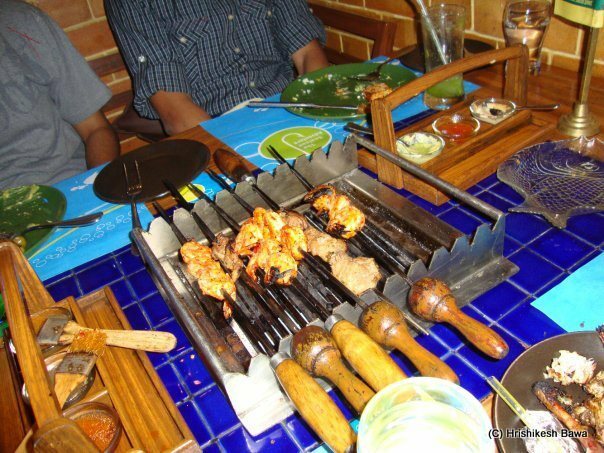 The center of the table has been cut out to make place for a mini barbeque, where skewered foods will be placed with red hot coals below the grille. Let me tell you that their food is wonderful. One of the best I have ever had. My friend and I literally hogged our way through them. When we were about to be feel full, we asked for the bill to be brought in. The server who came asked if enjoyed our main course, which made my ears twitch and ask him where the main course was, followed by asking him if we would be charged extra for it (sheepishly so, I might add). The main course you see, is part of the package. It is not served to you at your table, you have to go take what you want in your plate instead. There are salads, soups, daals, sabjis, some pulav or biryani of some sort. Rotis and naans are served at your table though. 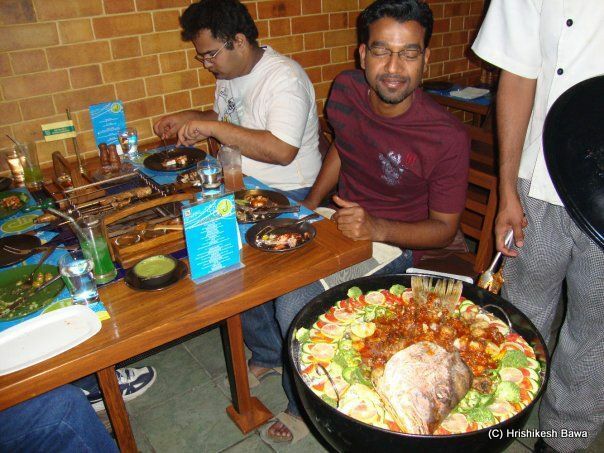 Yes, both veg and non-veg options are available in the main course as well. I had my second emotional surge when I saw that there was a big assortment of desserts as well. 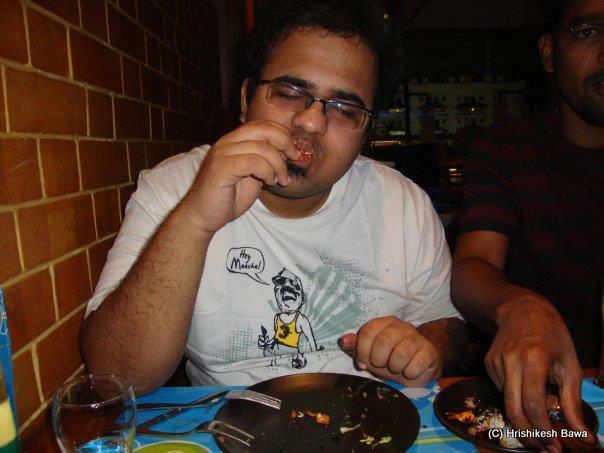 Belt loosening, salivating and becoming a poster boy for ‘kid in a candy shop’ later saw me eating even more. 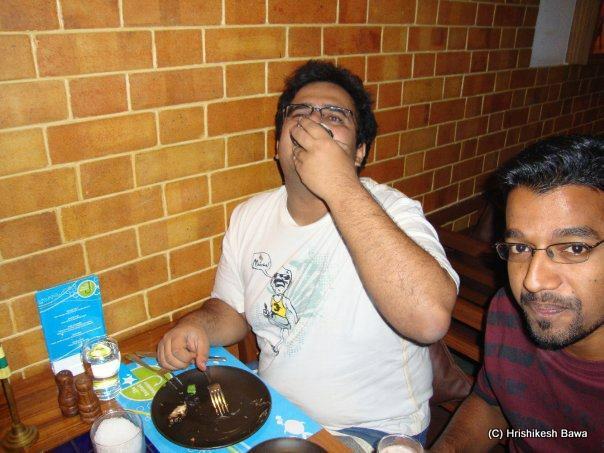 This is how it is at all barbeque nation places, and how I am each time I visit them. 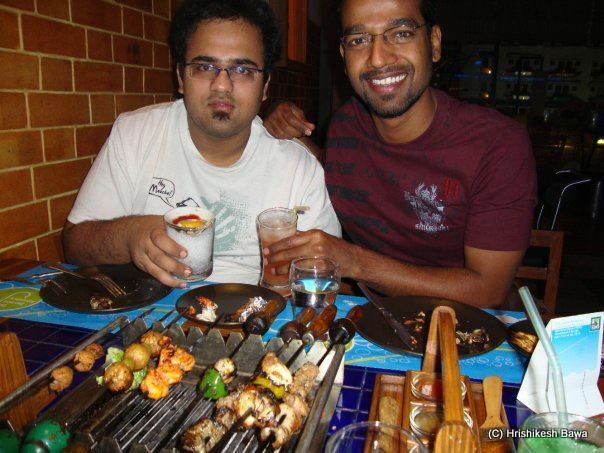 I have been to this particular Barbeque Nation many times, and once to a different city as well. While the food was awesome at both the places, I have a soft corner for this on account of the fondness for the staff here who are ever so courteous and happy to serve you. No matter how packed the place is, their service and quality doesn’t go down. I have pictures of one such time spent there with friends, which I will share with you now.